FX TCA is rapidly gaining acceptance from the buy-side, helping institutional investors to improve upon post-execution analysis. Boston, December 19, 2013 – Transaction cost analysis, which provides data that explains how trades perform against specific benchmarks, has increasingly become a focal point for alpha-seeking asset managers the world over. Though market participants once saw TCA as a basic compliance monitoring tool, asset managers across asset classes and derivative products nowadays use it to select trading venues and analyze algorithmic strategy. FX TCA usually means post-trade analysis, but firms are beginning to augment traditional TCA with pre-trade and intraday analysis, enabling traders to aggregate fragmented pools of FX liquidity onto a single venue, achieve better executions, and predict and adjust real-time performance. 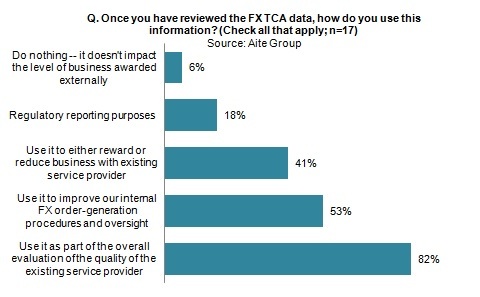 Based on 2012 and 2013 qualitative Aite Group surveys of buy-side investment community members, this report discusses the key trends developing in FX TCA and the current views and best practices of buy-side end users in a wide range of roles, from the senior pension and endowment executives who set up investment policy guidelines to the currency portfolio managers and FX traders making daily FX trading decisions. This 44-page Impact Note contains 31 figures. Clients of Aite Group's Institutional Securities & Investments segment can download this report.